← RealClearScience: Most Transparent News Site Ever! Immunologists are fond of making analogies with law enforcement to explain how the immune system works. Macrophages, cells which gobble up invading microbes, are often compared to beat cops, patrolling the neighborhood for any signs of trouble. Neutrophils, which my former graduate school advisor likens to “little hand grenades,” are like miniature SWAT teams, rushing in with guns blazing, shooting first and asking questions later. T-cells, which coordinate the immune response, are akin to intelligence officers, while the antibody-producing B-cells, which target highly-wanted suspect pathogens, are similar to the FBI. Most of your body’s cells, with the major exception of red blood cells, are covered with a sort of identity card called major histocompatibility complex (MHC) class I molecules. It is these proteins, along with their class II counterparts, that must be matched for an organ transplant to be successful. If there is too much of a mismatch between a donor’s and a recipient’s MHC proteins, the recipient’s immune system will reject the organ. This may, at first glance, seem unhelpful. Organ rejection is a bad thing. True, but our immune system didn’t develop with organ transplants in mind. Instead, it evolved to fight off foreign invaders, and that is where the “identity card” function of the MHC proteins becomes invaluable. As shown above, a healthy body cell expresses both an identity card (MHC class I) and an activating ligand. The latter tells the NK cell to, “Kill me!” while the MHC class I molecule says, “I’m safe! 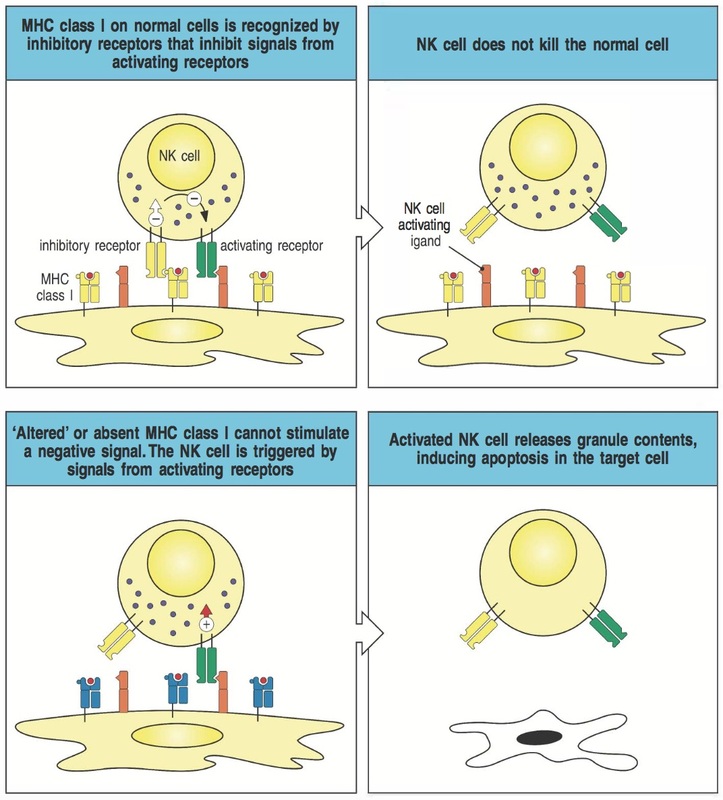 Don’t kill me!” If an NK cell receives both signals, it does nothing and lets the cell live. But cells that express an altered or damaged MHC class I molecule are unable to transmit the “Don’t kill me!” signal. Thus, they are obliterated by the NK cells. This method of law enforcement might seem rather harsh. However, NK cells know that tumor cells and cells infected with pathogens often are unable to properly express MHC class I molecules on their surfaces. The lack of an identity card is a telltale sign that something went horribly wrong inside the cell. Though the term “secret police” makes us feel rather uncomfortable, at the microbiological level, this clandestine group of assassins is absolutely vital to our health. Indeed, the natural killer cells appear to be most active during the long lag when T-cells and B-cells are preparing to launch their own assault on a foreign invader. Source: Murphy KM (2012). Janeway’s Immunobiology. 8th Edition. New York: Garland Science.